Mordor Orc Character Token – Head to the far left of the area where you’ll find a gold ring with a fishing rod glowing above it, switch your character to Merry and press the A button to use the fishing rod. Merry will pull a chest out of the water using the Y button break up the chest to gain the Mordor Orc character token. To the top right of your current position you’ll see a dig spot infront of a black rock, switch your character to Aragorn and press the A button to dig up an magic axe from the dig spot. On the floor you’ll see some gold squares (footprints), follow the footprints to find a hidden object and then press the A button to reveal the hidden object. Press the A button to pick up the object you’ve just revealed and follow the silver arrow. Press the A button infront of the downwards silver arrow to place the piece. 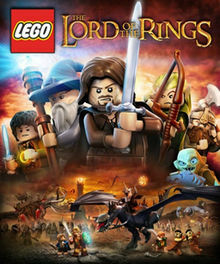 Head back to the left of the area where you’ll see a target and a leaf covered wall, switch your character to Legolass. Press and hold the Y button and use the directional buttons to aim at the target, when the crosshair is on the target release the Y button to shoot. Jump onto the ledge from the left of it (shorter section) and jump over to the swinging pole by pressing the B button. Press the B button at the right point to get your character to jump over to the platform to the left. Bilbo (Adventure) Character Token – When on the platform jump up the platform to the left and head behind the crate where you’ll see a spiders web. Target the web and shoot it to drop a chest to gain the Bilbo (Adventure) character token. Stand behind the crate and push it off the edge of the cliff. Drop off the end of the cliff and press and hold the A button to place the wood pieces up the wall. Switch your character to Sam or Aragorn and press the A button to light a fire which will clear the climbing wall. Walk up to the wall and your character will climb it, at the top jump off to get on to the platform to the left. Press the A button again to light a second fire which will clear the wall for your character to climb again. At the end of the wall you’ll see an object on a platform, drop down onto the platform and pick up the object by pressing the A button. Follow the silver arrow and place the object. To the right of the screen you’ll see another object, press the A button to pick up the object and follow the silver arrow placing the object infront of the arrow. To the right of the area you’ll see a large silver wall, switch your character to any of that the charging ability I will be using Aragorn for this. Press and hold the Y button infront of the wall and release the button to charge at the wall to reveal a crawl hatch. Now switch your character to a small character to use the hatch, I will be using Sam. Stand infront of the hatch and press the A button to get a leg up through the hatch. To the left of the platform you’ll see a plant spot, while using Sam’s character and press the A button to plant some seeds. When the plant has grown use it to jump across to the platform to the left where you’ll see another object. Press the A button to pick up the object and follow the silver arrow again, then press the A button again to place it. Switch your character to Gandalf the Grey and press and hold the A button while using the directional buttons to move the object onto the silver door and repeat this for all four pieces. Stand infront of the door and you’ll have to solve the puzzle by putting the pieces into the right places. (The two very detailed pieces need to go on the bottom facing the right way and the other two at the top). After a long cut scene you’ll find yourself by a lake with a monster in the middle. To defeat the monster start with Gandalf and stand in the water until you see a red target in the water. Press the Y button to shoot at the monster which should make it drop its head; while it’s head is in the water tap the Y button as many times as possible to hurt the monster (if your hitting it, it will turn green). When it retreats into a large green head in the middle of the water, switch your character to Legolas by pressing the X button and shoot at the green head to reduce it’s health bar at the right of the screen. Repeat this until you have defeated the monster. After a long cut scene you’ll gain a new character who has the ability to smash things. To the far left of the room you’ll see a gold door which looks cracked, stand infront of it and press the Y button to smash the wall, behind you’ll find a krank handle; pick up the krank handle and place it on the well. To the left and right of the well you’ll see two boxes, smash these up by pressing the Y button next to them to reveal two piles of LEGO pieces. Press and hold the A button next to each pile to rebuild the well. Switch your character to Legolas and aim at the target above the chest to release the chest by pressing and holding the Y button. Then switch your character to Sam and set the wooden fence on fire to the far right by pressing the A button to reveal the key for the chest. Pick up the key by pressing the A button and use it on the chest by pressing the A button to place the key and then press the A button again to turn the key, opening the chest. Pick up the cog that you got from the chest and place it on the well by pressing the A button. Finally, press the A button to use the krank on the well to save the character. In the next area, switch your character to Legolas and aim and shoot the targets to the left and right of the door to release some handles. Jump onto one of the handles and your partner will jump on the other to release a wooden plank securing the door. Next to the door you’ll see an object, press the Y button to shoot/break up the object and then press and hold the A button to guard the door. The door will break open and a number of enemies will come out. Defeat all of the enemies until you see a short cut scene. After the cut scene you’ll be faced with another boss in the form of a giant troll. In order to defeat the troll you need to switch your character to Gandalf and build a rock with the pieces in the middle of the room by pressing and holding the Y button. Switch your character to Legolas and jump on top of the rock, tap the B button constantly while using the directional buttons to jump on to the platform. Press and hold the Y button next to the piece of rocks to build a column where the troll will get caught on. Walk along the chain towards the troll and Legolas will jump on trolls back and shoot it in the head. Switch your character back to Gandalf and press and hold the Y button to put the rocks together again, this time to make a set of stairs. Switch your character to Gimli and head up the stairs. Use the smashing ability on the golden broken object to the top right of the platform by pressing the B button to jump towards the object and pressing the Y button the smash it. Crawl through the hatch by pressing the A button to the other side of the room. Head to the far bottom left of the platform and break the smashing platform like before to reveal a load of bricks. Press and hold the A button to build another column with the bricks then press and hold the Y button to break the column and defeat the troll. This entry was posted in DS and 3DS, Games, LEGO Lord of the Rings on April 7, 2013 by Tasha. Head up the path and switch your character to Legolas by pressing the character picture on your bottom screen. Use the archery skills of Legolas to dispatch the Spies of Saruman by pressing and holding the Y button and then use the directional buttons to target the Spies of Saruman that are sitting on the columns. When you have the Spies of Saruman in your target release the Y button to shoot and kill the Spies of Saruman; do the same for the other Spies of Saruman around the area. When you have defeated all of the Spies of Saruman, a krank will fall to the ground. Press the A button to pick up the krank and head to the right of the area where you’ll see a krank box and a gate. Place the krank handle on the krank by pressing the A button and then press the A button again to krank the handle which will open the gate. Head through the gate into the keep, while using the Legolas character you can do acrobatics on the acrobatic objects about the walls. At the back of the keep stand under the pole on the wall and press the B button to jump up on the pole. While Legolas is swinging press the B button to jump to next pole and use the directional buttons to direct him to the platform above. On the platform you’ll see a box, push the box off the end of the platform by standing behind it and walking forward. The box will fall of the end and break up. Jump off the end of the platform and press and hold the A button to build a ladder with the LEGO pieces (this allows your other character to get on the platform). Change your character to Gimli who is a Dwarf and stand infront of the column on the right hand side of the platform. Press and hold the Y button and release the Y button to break up the column. Head down off the platform and switch your character to Gandalf the Grey so you can interact with the Wizard LEGO object. Press and hold the A button to pick up the broken column while holding the A button press the right directional button to move the column, when the column is in the right place it will be released automatically and clear the path ahead. Head up the path and continue through the circle of light. Make your way along the path and watch out for the falling rocks to the far right you’ll see a blocked path so I headed towards the screen and ended up sliding down a long slide with studs down it. Use the directional keys to guide your character down the twisting slide to the bottom (you can go back to top of the slide by walking up the path to the left of the slide). (Free Play Mode) – To the right of the slide you’ll see a load of objects, TBC. Please note: I will be playing the level through when I have completed the game and will fill in any gaps. Head to the far right of the area to complete the level. This entry was posted in DS and 3DS, Games, LEGO Lord of the Rings on March 10, 2013 by Tasha.